For some time I have hankered after a garden pond (there are few things better for encouraging wildlife into one's garden). On a whim, I recently took the plunge (sorry, terrible pun!) and dug one. Though only a few weeks old, already I'm seeing enough life to keep me busy blogging long into the future. 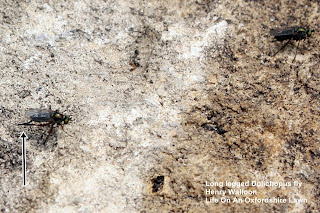 Photo 1 shows two flies sunning themselves at the water's edge. There were several dozen around the pond. The 'colony' was a constant flicker of activity and it was this that first caught my attention. 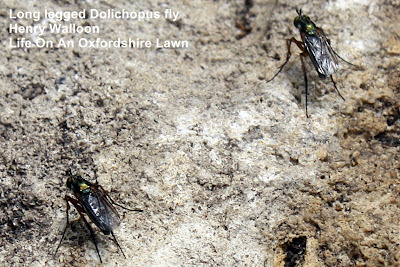 Individual flies seemed to be attracted to movement and if another landed closeby they would quickly go 'into action', advancing rapidly towards the new comer. In a few cases one would even jump on top of another and the two launch into flight (at which point it was impossible to follow them by eye). I observed a number of instances of one fly standing close by another and methodically rubbing its back legs together. I've highlighted this with an arrow in photo 2. I recently wrote at length about the courtship signalling behaviour of a related fly (Poecilobotus nobilatus) I found in my garden. I would like to think I was observing something similar here. Whether I was however, or whether it was just some coincidental preening I can't be sure (can anyone comment?). So, how about the identity of my fly? Unfortunately, for the non-expert (=me! ), identifying a fly is a decidedly non-trivial business. Firstly, a low power microscope is pretty much essential. Next, you need to be fortunate in finding an identification key. After that you need to be prepared to work through the copious technical jargon that the specialist keys will hurl at you. Finally you need the magic ingredient: experience! How did I fair against this list? Well, I have a microscope; I was also fortunate to find the free online key by Dennis Unwin to the families of British Diptera, and "A Key To Swedish Dolichopodidae" by Igor Grichanov; For several hours I diligently applied myself to translating the jargon in the keys and scrutinising my fly's features. I was able to determine that my fly's "post ocular setae" (=bristles behind the eyes) are long and all of them black (see '1' in photo 3). Also, that the base of my fly's antennae sprout tiny hairs (see '2' in photo 4); that the shape of it's "occiput" (= the back of the head) is convex (see '3') and that it sprouts two rows of "acrostichal setae" (=hairs down the centre of its back - see '4'). I worked through a dozen other similar features. And the result of all my efforts? Well, further aided by a study of my fly's wings (see my discussion of insect wings here) I'm confident that amongst the 80-odd families of British fly, mine is a member of the family Dolicopodidae. Next, I'm fairly confident that of the 30-odd genera within this family, mine is a member of the Dolichopus genus. 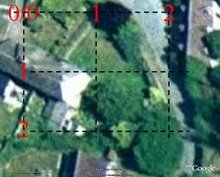 And finally, of the 51 British species within this genus (I got this number from the Dipterists Forum website)... well, I am not at all confident (!) mine is a Dolichopus ungulatus. The one thing you can't look up is experience. 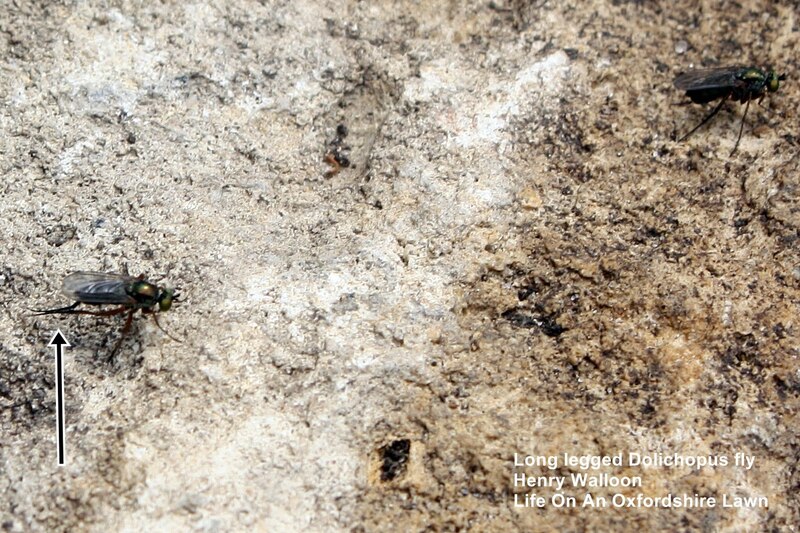 I could well be wrong about this, but could the photos of the live flies be female Poecilobothrus nobilitatus? I can't see any bristles on top of the hind tarsal first segment. However, the pinned one looks as if it could be something different. Many thanks for stopping by. I am always delighted to be questioned on my identifications. They are far from the work of an expert or even a well schooled amateur! What I can say is that there are lots of P.nobilitatus around my pond at present (lots of signalling males). When the photo was taken (a few weeks ago) however, though I watched dozens of these flies over the space of 30mins on the day, I didn't see any male P.nobilitatus' (based on looking for white wing tips). Would it be unusual to see dozens of females alone like this? The mock orange looks fantastic!